I am sure this isn't the weirdest thing I have done. It's certainly a bit unusual. There is of course a point. You see I went dumpster diving. I came up with these two tubes of caulk and brought them in to the house. They're empty, you couldn't caulk a thing with them. Why I got them was because of a recommendation I needed. I'm excellent with patching things up. Spackle/Caulk/Paint. The simple sort of repairs that you get around to eventually when they annoy you enough to do so. The hardest part of that particular job is getting all the products that you need for the job. Use the wrong kind of caulk on a wall and you will come back to it later because it fell apart. I'm going through that in my bathroom. My own repairs from a year ago are holding up beautifully but the plaster AROUND my patches is falling apart. When it was patched Back In The Day before we got the house, they used crappy patch. It's melting away due to the humidity in the bathroom. Since this is Florida and the humidity on a dry day starts around that of a wet sponge and falls to about 75% outside, we have to aggressively keep the house dry. That means Air Conditioning. We cool the place to 78F, 24 or 25C during the day depending on whether I was outside playing landscaper or if I am sitting under the ceiling fan. In comparison, I have been told that a British House is heated to 60F/10C during the winters. It's all what you are used to. But that caulk. Use the wrong caulk outside and it will either never "cure" (thicken and harden to do its job) or it will simply shrink and shrivel away in a year. Since the house is made with Concrete Block Walls and covered in Stucco and some Broward County Paint, it needs to be maintained. Broward County, Florida has some specific colors of paint that you can get from the county to paint the house at free or discounted rates. Or Had. I'm not sure. Personally I rather think that if we didn't have ground water irrigation, I'd have this place in Zinc Oxide White with blue trim. A bit of the Greek Isles shining in the sun. With Rust Colored accents. Never mind. But that maintenance needs the patches and the right brands. When the Window Guys rolled to a stop here, I went out and looked at what they were using to finish the job. So I stuck my head inside my big blue trash can in the yard, dragged out the empty caulk tubes, and asked the window guys to explain the caulk they used. A window is bolted into place with thick blue screws, then caulked, then the trim is put in place and stained. Hopefully it's all "square" but since this house isn't, neither are the windows. But that caulk. I wanted to make sure that I got The Right Stuff. Three years ago I caulked the tub using a backing bar and it's holding but since there is such a large gap, it needs touch up. There are some random cracks in the wall that I can fix, and a few weird spots here and there. Then there's that disintegrating plaster. Since some of that is outdoors, I need to know what to use. Indoor caulk is typically water soluble until cured. Makes it nice and easy to clean up when finished. 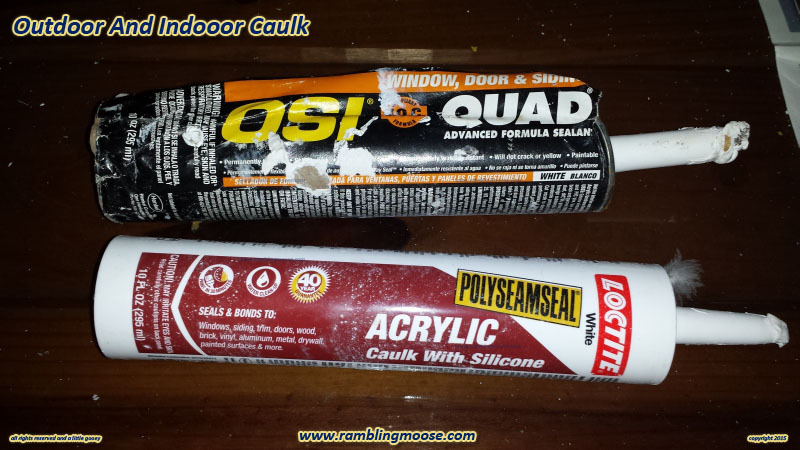 Outdoor is oil based and a major hassle to clean, but you won't be bothering that caulk for a while and you want the extra strength that a slow cure will give you. So that picture. The top is Outdoor, the bottom is Indoor. We will be using that henceforth. Outdoor Caulk is: OSI Quad Advanced Formula Sealant. Indoor Caulk is: Loctite Acrylic Caulk with Silicone. Both are by Henkel Corporation. In the past I have used some of these caulks for some oddball things. I can vouch for that indoor caulk in the past as glue to hold electronic parts together. There's a battery pack that I made from old laptop batteries that I held in place with a "good" amount of white caulk. I also used it to hold a footprint from my old dog Lettie as she was nearing the end of her days. It's now in a frame with her collar on my room divider. That sort of thing won't mean a thing to anyone but us who cared for her, but the caulk is still holding things together. But your mileage may vary, and that sort of use is clearly at your own risk.